"Don't time travel into the past, roaming through the nuances as if they can change. Don't bookmark pages you've already read." 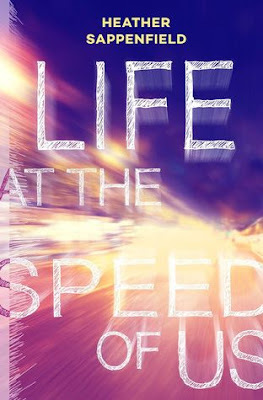 Heather Sappenfield, an American award-winning author, pens a gripping YA tale, Life at the Speed of Us that unfolds the story of a teenage high school girl, who after the death of her mother in an accident, chooses to become silent and to seek solace under the company of her badass boyfriend, but another accident leaves her out of the world in a different era, somewhere in the long forgotten past. Sovern decides to stop talking at all, after surviving a car crash that killed her dear mother, as she blamed her own voice for the cause of it. That eventually distances her relationship with her father. To seek comfort, she even spends her time under the company of a bad guy, named, Gage, who used to provide her with booze and drugs. But a skiing accident leaves her curious about space and time as she meets a guy who intrigues her with the idea of quantum physics, the ideas about parallel universe, the dimension concept (think Interstellar, the movie! ). Soon, Sovern makes up her mind to travel back in time so that she could reunite with her dead mother. Firstly, I must say, the author has introduced her readers with a rarely used subject, i.e., quantum physics to explain the facts and fiction about time traveling, which really kept me glued and engaged. The writing of the author is fascinating, yet at times, there are too much technical jargon, that made the story to divert from it's main story line. The narrative as usual overshadowed by the use of too much rules and theorems of quantum physics, but in general, it is interesting. The pacing is bit slow as the story develops at a snail's pace. The characters are well-developed and are kept closer to reality. The main characters, Sovern, at times annoyed me, and at times made me fall for her bravery and intelligence. Sovern is suffering from grief and her way of dealing with it is very much inspired from reality and I liked how the author compassionately justified Sovern's shifting demeanor. The rest of the characters are captivating enough to keep the readers on their edges. Although the characters aren't that evolving in nature. The concept that is used is quite unique and highly enlightening for the readers. And everything, all the scientific aspects have been descriptively depicted by the author into this story. The romance is sweet and the author has portrayed it with lots of emotions that will make the readers feel for the characters. Overall, this is a compelling book of time-travel centered around a teen love story. Courtesy: Thanks to the author, Heather Sappenfield, for giving me an opportunity to read and review her novel.